Those looking to serve on the Yukon government’s commission on electoral reform will now have an extra week to submit their applications. That’s after the deadline to apply was extended from April 26 to May 3. That’s a move that Premier Sandy Silver said Wednesday afternoon came out of conversations with both opposition parties. The government had initially come out with the call for applications in a release issued on Tuesday which noted an April 26 deadline. Just a day later, on Wednesday afternoon, an update showed the release had been changed to note a May 3 deadline instead. Speaking Wednesday after question period, Silver said his intention wasn’t for the process to drag on. “We’re going to go through the process of listening to feedback” from the opposition parties to appoint the three-member group, he said. The intent is to eventually make public the report the commission submits to the government later this fall. That commission will serve a term from May for an estimated six months, but could extend to the end of this year. According to the draft terms of reference, each commissioner is to be paid for about eight days of work every month for the six months. The group’s total budget is just over $178,000, and includes secretariat support that includes research and administrative help. The commission will look to include feedback found from the government’s public engagement, the results of which were made available earlier this week. According to the draft terms of reference for the group, the mandate of it is to include the feedback to do three things. • improve how Yukoners make their voices heard. If the group finds there is a need for electoral system reform based on feedback from Yukoners, it could suggest “the strongest electoral system for territorial elections and propose a way” to bring this suggestion forward to voters. When looking at how to improve political parties and how elected officials work, there is to be a focus on fair and transparent elections as well as political fundraising and spending rules. The last goal of improving how citizens make their voices heard includes making sure they have flexible and accessible voting choices, are registered to vote and have the necessary information to vote, as well as understand how government works. As for the results themselves, under five per cent of respondents chose options that suggested they did not want to pursue electoral reform or have a commission. If there is a need to change electoral systems, the same number of people who believe the role of the commission is to show the strongest system for territorial elections, feel it should also recommend a public education plan about other systems. Other results show that half of respondents feel elected officials reflecting the diversity of the territory is important, but most believe fair and transparent elections and political fundraising and spending are more important. The territory is just one Canadian jurisdiction looking at the topic of electoral reform; currently, all use the same “first-past-the-post” style, but areas like P.E.I. are to hold a referendum to gauge interest in switching systems later this month. The Yukon’s southern neighbour, B.C., rejected making a change to proportional representation in a referendum late last year and opted for the status quo of first-past-the-post. Brad Cathers, the Yukon Party critic for democratic institutions, objects to the delay in the process. “The Liberals have been caught trying to stack the deck on electoral reform in favour of the Liberal Party,” he said Thursday. The party is calling on the government to rethink its “non-collaborative approach to electoral reform” and work with all parties to ensure a fair and balanced process, Cathers added. The NDP also furthered its critique of the selection process Thursday, as MLA Kate White asked if the premier would press pause to gather all-party support. “In order for the committee to be successful and to be considered legitimate, the terms of reference and the principles guiding its mandate need to be agreed upon by all political parties in the legislative assembly,” White said. Silver countered by saying he will commit to working with both opposition parties and reiterated that the draft terms of reference were just that – a draft. Meanwhile, Sally Wright, with Fair Vote Yukon, felt the premier is placing too much on his shoulders. Speaking to reporters Thursday, Wright added the group has put forth the idea of a citizens’ assembly, with such groups having been created over the years in areas like Ontario and B.C. 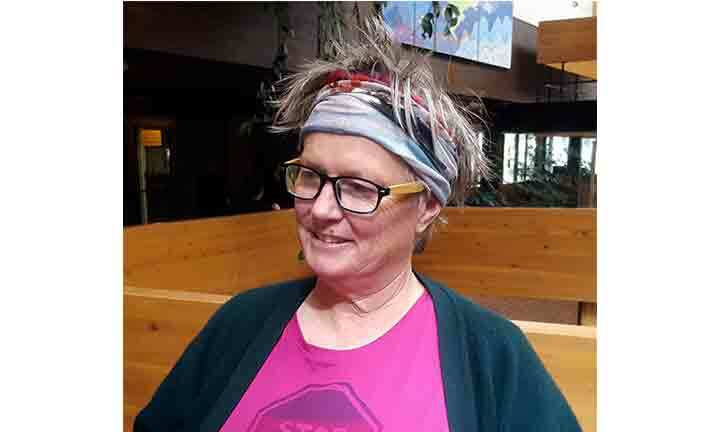 Wright, an NDP hopeful in the 2016 election for the riding of Kluane (held by the Yukon Party’s Wade Istchenko), echoed the party’s worry that the work of the commission could run too broad. “There’s many things in here that are already covered by the Elections Act,” she said of the terms and survey results. “We want to talk about the vote; very clear, concise,” she said, echoing NDP Leader Liz Hanson. The funny thing in all of this is that the NDP are complaining that the survey is skewed toward KEEPING the current system while the conservatives (YP) are saying it is skewed toward ENDING the current system. To me this says that the Liberals probably got it right. Nice and centered. Sally - I do actually agree with you on the “wave of hate” election comment. As it seems the Alberta folks formed a huge tsunami of relentless energy expressing their hatred for commies. As you can tell, I rather enjoyed watching her broom being pulled. You are awesome at displaying your virtue, and the no voice thing. Tuesday’s Orange Flush, was awesome. That blue wave will soon cover from coast to coast to the other...coast. Sally please enjoy your Easter weekend and let us all be grateful we reside in Canada...whilst it is still here. If you are a diversity at all costs supporter, perhaps wrap your mind that in this big diverse pile...there are folks like me and yes, Roy, that use the voice we have. You and your comrades do not have too like it, it just is. Oh yeah, blind faith in anything is foolish. Jason can be a fool too, and has been. How he governs still remains to be seen, I will stay tuned objectively. @ Roy and Josie Wales. Unfair comments to Sally Wright but unsurprising. As usual, a couple of ravens sitting on the light post squawking at the odd stray dog. Man, we get it you hate the NDP and the Liberals, women, gays, immigrants, Indigenous people and whatever and whoever else looks or thinks differently than you. Your comments are not witty. They are dull. Insulting. Judgmental. Mean. Spare us the rant about political correctness. Maybe get out and smile at a few people . . . it seems that everyday it is cloudy and stormy in your world. I know you are not kidding Roy. Women are always criticized for not caring about their looks. I am too busy volunteering on behalf of those with no voice, and on days like today, when an Albertan government is elected on a "Wave of Hate" like Mr. Kenney just was, I would rather stand for hope with Ms. Notley at anytime. Disheveled or not. YaaaaaaaaaaAAAAAA Hooooooooooooo, Rachel Notley and her comrades are outta power, outta steam. Justin....heed this, you are next! Perhaps they could relocate to Venezuela and “educate” the masses there? Hey Roy...true that eh? The National Destruction Party is rife with that type. Looking very forward to Tuesday night, popcorn and the computer, watching Rachel Notley and her team getting tossed outta office. ....then maybe some of these folks who fled the gulag that became Alberta after she somehow got a mandate to “rule” could return home? Roy if ya wish a good belly laugh, watch the CBC coverage. Be just like watching the Clinton News Network when the Donald upset/interrupted...that other planned coronation. One more thing, a communist is just a socialist that “really, really” means it. Maybe if the Yukon NDPs didn't look like they all just rolled out of bed, people would take them more seriously. I'm not even kidding, and you all know it.